Cancer chemotherapeutic agents are developed and approved largely on the back of studies that demonstrate an average efficacy and safety across possibly thousands of patients. Even for emerging biomarker-driven treatments, there’s still no guarantee that every matched tumor will respond in the same way to the same therapy. The situation becomes even more complicated when treating metastatic tumors, for which therapeutic guidelines may indicate that there are a number of possible approaches, each with similar average response rates. The upshot is that individual patients will often have to undergo multiple rounds of treatment on a trial-and-error basis. Ideally, it would be possible to screen individual tumors for response to different treatments so that the best therapeutic approach can be identified in advance for each patient. The current gold standard for personalized screening involves directly transplanting primary tumors into immunocompromised mice, waiting for the tumors to grow, and using the resulting patient-derived xenografts (PDX) as a model for testing tumor responses to cancer therapy. However, this approach requires a significant amount of tumor sample, and it takes at least a month for the transplanted tumors to engraft and grow in mice so that the effects of therapy can be observed at different levels. As a result, the approach is impractical for screening in a clinical setting. Researchers in Portugal have now shown that zebrafish larvae represent a much faster, and highly sensitive in vivo model for assessing how individual tumors respond to cancer therapy. Rita Fior, Miguel Godinho Ferreira, and colleagues at the Champalimaud Centre for the Unknown (CCU), in Lisbon transplanted cells from human colorectal cancer (CRC) cell lines into zebrafish larvae. Within just a few days, the resulting xenografts could be used to investigate differences in tumor cell proliferation rates and metastatic and angiogenic potential. The researchers could also investigate—with single-cell resolution—cellular changes within the same tumor. The zebrafish xenografts also represented an accurate measure of sensitivity to the colorectal cancer drug cetuximab, and exhibited treatment responses that mirrored those of xenografts in mice. For their proof-of-concept studies, the team then injected zebrafish larvae with cancer cells taken directly from primary patient CRC tumor samples, without first growing the cells in the laboratory. They found that the human tumor xenografts (zPDX) that developed in the larvae responded to cancer drugs that were used to treat the patients in exactly the same way that the patients’ tumors responded. The researchers’ initial experiments confirmed that when cancer cells from different human CRC cell lines were injected into the zebrafish larvae, the cells implanted and proliferated into xenografts that exhibited tumor-specific cellular and angiogenic charateristics, as well as the ability to form metastases. “What was particularly encouraging was the very good engraftment rates,” Dr. Fior tells GEN. Essentially, the cells behaved in the zebrafish larvae exactly as they would do in a native tumor. 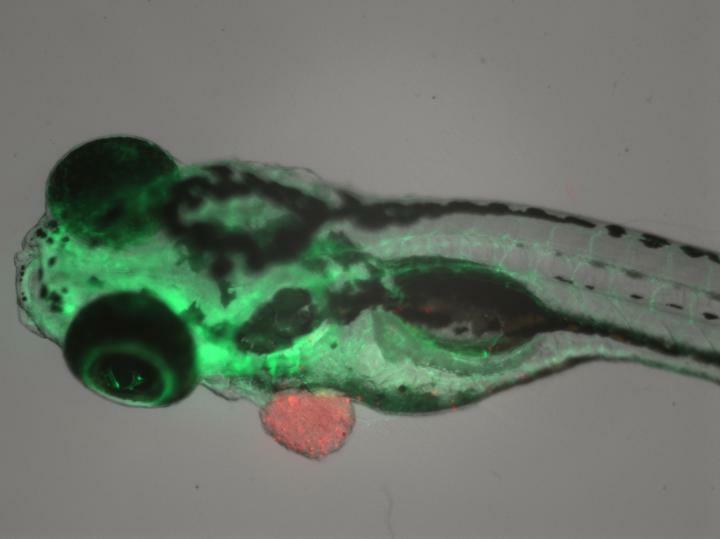 The zebrafish larva xenograft model also demonstrated sufficient resolution, “at the allele level,” Ferreira claims, to detect different treatment requirements in tumors that are genetically very similar. In subsequent proof-of-concept studies, the researchers confirmed that in four out of five cases, zebrafish avatar zPDX xenografts derived directly from primary patient tumor samples responded to chemotherapy in the same way as did the tumors in the patients. “For two of the patients, the tumors transplanted into the larvae did not respond to the chosen chemotherapy,” comments Rita Fior. “And in fact, consistent with our results, a short time afterward, those patients relapsed.” On the other hand, two other patients whose avatars responded to the treatment “are still doing well as far as we know,” Dr. Ferreira adds. Interestingly, when the researchers sequenced the tumors for which the matching zebrafish larvae xenografts didn’t respond to cetuximab, they found that in each case the tumor carried mutations that were highly linked with cetuximab resistance, “corroborating our zPDX results with genomic data,” the team writes. The team will have to validate the system in hundreds of patients to confirm the predictive power of zebrafish larvae xenografts for multiple tumor types and therapies. “If everything goes well, we will be able to inform oncologists on the result of the different therapies in the avatars; they will always have the final word in terms of deciding which therapy to choose, but they will be able to base themselves on individual tests,” Dr. Ferreira concludes. Previous articleTo Surge or Not to Surge?